If there’s one thing I love, it’s a game that can give me a true emotional reaction, even when I think I know where it’s going. And I love Red Dead Redemption 2. Few games in recent memory have felt as full of promise as this one. The pre-release material promised an expansive, rich experience as an outlaw, telling the tragic tale of the Van der Linde gang’s descent into anarchy. And, for the most part, the finished game has delivered on that — with a few small caveats. You may have already read my colleague Nino’s preliminary review (and if you haven’t, you should). He and I both played the game for over a week before its release (Rockstar provided us with review codes), but it quickly became clear we weren’t going to finish the story or even a majority of the game by the time we were allowed to publish. Normally, not 100%-ing a game before giving an opinion about it isn’t a big deal. We’ll give it our best, but there are only so many hours in life and games such as these are generally quite the commitment. And usually, it’s very easy to get a feel for a game with 20-30 hours under your belt, since by that point you’ll have a grasp of the mechanics and for how the story is going, if not its overall plotted course. But, given the way the first game ended and how deeply affecting it was (and how it altered everything about the game that came before it), it would be the height of folly for us to not to get as far as possible in the story before doing the final review. Hence we’ve split the bulk of our thoughts into these two separate parts. I’ve since finished the game, up to and including the two-part epilogue. So consider this your early warning: I’m going to be spoiling the hell out of the end of this game, as well as stuff that happens in between on the main story quest line. Because, just like its predecessor, RDR2 ends on quite the powerful note. The story follows Arthur Morgan, the enforcer of the infamous Van der Linde gang that John Marston was tasked with wiping out in Red Dead Redemption. Gruff, weatherbeaten, and more intuitive than he lets on, Arthur is a morally-ambiguous Lee Van Cleef-like character to John Marston’s more conventionally heroic John Wayne. After a robbery gone bad, the gang flees into the mountains. There they attempt to regroup and find their way back onto the path to prosperity, one bank heist, train robbery, and long con at a time. I feel I should begin by mentioning my thoughts about the gameplay. Nino covered most of it in his review, so I’ll just say it’s the trademark Rockstar open world polished to a mirror sheen and bursting with stuff to do. In fact, I may have finished Arthur’s story, but I’m convinced I left behind at least 30 percent of the game in side missions just because I wanted to finish my story review sometime before the death of the sun. As for the mechanics, I have some reservations — like Nino, I didn’t exactly care for the “cores” part of the stats, as it felt very fussy. I also had some trouble with the weight mechanic, in which Arthur’s stats will suffer if he’s over- or underweight. I ate as often as I thought to in the game, and for me Arthur was perpetually underweight — and I had no idea how much I was supposed to eat in order to keep him out of that state, so a little clarity would have been nice. That said, every type of gameplay in this game, from the hunting to the criminal pursuits to the minigames, feels necessary and in-character for Arthur. And even halfway through the story, I was still finding new ways of doing things. Imagine my surprise when I figured out I could lasso deer and drag them to me for a clean, throat-slitting kill — much tidier than bullets. But for a game with this much deference to realism, there are one or two places where I just want to grab it and say, “Hey, not that much realism, buddy.” The biggest one? Post-shootout loot-gathering. When you get done perforating fools, you naturally want to pick their bloodied pockets for cash and trinkets. Trouble is, Arthur can only do that by literally picking up the bodies and rifling through their clothes. After a decently-exciting gunfight, you’ll end up with fifteen-to-twenty dead guys, and damned if Arthur won’t fondle each body individually in order to absorb their loot. I get that that’s what he’d have to do if this was real life. But by the tenth body I find myself thinking about just how lovely it’d be if I could pick up treasure by running over the bodies like I’ve got a vacuum jammed down my chaps. So much for the gameplay. Let’s get to the story. It takes place over the course of several months, during which we begin to see how a series of bad decisions and poorly-planned heists sends the gang into a downward spiral from which we already know it shall never recover. Arthur, being one of Dutch’s adopted sons, is torn between loyalty and pragmatism — doomed, as we fans are, to watching the gang’s downfall and helpless to stop it. Despite that rather bleak skeleton, the meat of the story is actually about the other members of the gang, their relationships with Arthur and each other, and how they react to the world around them. And I never thought I’d say this, but a game from a studio that is not Bioware has managed to make me care about my squadmates on a personal level. I even did that trademark Dragon Age/Mass Effect thing where I went round after every mission and talked to everyone, just so I wouldn’t miss any fun dialogue. These characters are by far the game’s strongest asset. The whole story could have fallen apart if the Van der Linde gang and its twenty or so members had been underdeveloped, unconvincing, or unpleasant. Instead, we get a family full of interesting, layered, complex people. Even the ones we’ve ostensibly seen before, like Bill, Javier, and John, are all compelling in their own right beyond what we saw in the first game. It’s all in the details. For example, every character in the gang has their own named, unique horse, and they each ride it when they’re out and about. (Dutch has a white stallion named The Count, because of course he does.) They each have conversations with each other that have nothing to do with Arthur. And they do things real, intelligent people would do: for example, while having a sensitive conversation with another character in an open carriage, Arthur takes a moment to ask if the driver is in on their plans. That remark never becomes important later — the driver doesn’t betray them, or indeed appear again at all — but it’s a sensible remark a real person would say in that situation. That said, there is a bit of dissonance between this rather cozy depiction of the gang and the way the targets in RDR1 talked about their gang time — in particular, the way they spoke about Abigail. From what I remember, they all talked about her like she was the camp prostitute, with all the implications that entails. But here, we see she’s just one of a number of women in the gang, all of whom are treated respectfully by the men. Everyone also protects and raises Jack, which, again, makes the original game’s emphasis on John and Abigail’s desire to keep him away a little baffling. The voice acting is, generally, quite good. The standout is Benjamin Byron Davis as Dutch, whose well-bred tones betray a hypocritical familiarity with the civilization he so despises. Of the newcomers, Harron Atkins as the eager Lenny was my favorite. And of course it’s an utter delight to hear Rob Wiethoff return to the role of John Marston. That’s why it pains me to confess I wasn’t terribly fond of Roger Clark’s performance as Arthur Morgan. I didn’t hate it by any means — it just didn’t sound quite right. Let me explain. In RDR1, John’s gravelly drawl was perfect for him. Not only did it fit the character, it sounded perfectly natural — not a surprise when you learn it’s Wiethoff’s actual voice. He didn’t have to put on an accent so much as lean into the one he’s already got. By contrast, Arthur’s actor sounds like he’s trying just a bit too hard to do that there cowboy voice, pardner. If I could compare it to anything, it’d be Jeff Bridges’ borderline comical turn as Rooster Cogburn in True Grit. I can’t point out the exact problem in cadence or tone. It’s like when I hear grinding in my car engine — I may not know what the problem is, but I know it’s not supposed to sound like that. At the outset, the gamer has Red Dead Redemption 2 at a bit of a disadvantage, because we all know how this story is going to end, one way or another. That’s the tricky part about making a prequel. But I can tell you this much: RDR2 is a masterclass in how to make such a story, because it leverages what we already know from the first game to make a story that’s simultaneously tragic and very tense. The fall of the Van der Linde gang, and the descent of its leader from a confident, well-meaning pater familias to a twisted, deranged tyrant is done magnificent justice in this game. Whatever else I can say about it, the devotion to this slow-burning epic is brilliant, drawing you in slowly and making you feel every single stitch being pulled as the whole gang slowly becomes unraveled. Things really start to take a turn for the worse around the midpoint of the game, when Dutch’s partner and Arthur’s other dad, Hosea, is killed. After that, the game‘s focus becomes more corseted as the gang is squeezed into tougher and tighter circumstances. There are some questionable pacing issues — for example, there’s a short chapter that takes place on a tropical island which makes me wonder which of the devs spent too long playing Just Cause 3 — but other than that, the story moves along at a steady, if glacial pace. Heck, the environments themselves parallel the gang’s downward spiral. The gang begins the adventure camped on a beautiful, sunny hillside, and, as things get worse, is forced to move to a swamp, then into a grubby city, and finally into a cave. And every time things start to look up, I got a feeling of dread in my gut, an involuntary reaction a game hasn’t given me in a long time. I already knew how this was going to end, but the characters themselves were so determined, so sure this would be their Last Big Job that it actually worked. If it had for a moment broken the fourth wall, and included a nod tantamount to “yeah, you know how this’ll end,” the whole thing would have been ruined. But it didn’t, and that was what effected me the most. If there’s one thing that doesn’t feel wholly natural about Dutch’s tragic descent into madness, it’s the addition of Micah Bell. A nasty piece of work, he really has no redeeming qualities and is pretty much telegraphed to be the rat of the group. Most of the time, when Dutch has a bad thought, it’s given to him by Micah. I can’t help but feel that, if you cut him from the story, it’d seem just a bit more poetically tragic. We’d be watching Dutch’s brilliant mind twist itself to try and justify bad decisions and sloppy planning, rather than just him listening to the devil on his shoulder. Plus, from the way Micah purrs insults to Arthur in camp, and makes passive-aggressive catty remarks whenever he’s alone with Arthur and Dutch, it seems at times like he’s jockeying to be the latter’s boyfriend rather than his consigliere. I don’t mind there being a mean character in camp — not everyone can be a diamond in the rough like Arthur or John — but I don’t like that he’s the catalyst for the entire breakdown and I certainly would hope for more than a Wild West version of a Mean Girl. For a game from the company that created a whole series about having a good time as a criminal (Grand Theft Auto), RDR2 is, at heart, a game about how difficult it is to get away with being a truly bad person. Even the gameplay reflects this: crime is ruthlessly penalized, Arthur’s far from bulletproof, and the whole endeavor of trying to escape pursuing police feels more arduous than fun. Arthur’s attempts to balance Dutch’s waning sanity with the gang’s well-being come to a head in Chapter 6, when he’s diagnosed with tuberculosis. Knowing that he has little time left to live, Arthur goes out of his way to do right by the rest of the gang. His final act before dying about four-fifths of the way through the game is to help John, Jack, and Abigail escape an onslaught both from Dutch and the law in order to live a better life. He does this even if you’ve been playing him as a nasty, dog-kicking sonuvabitch up to now. It feels as though the game is trying to coax the player into sharing Arthur’s hopelessness — and, for me anyway, it worked. Honestly, what’s the point in carrying on, Trevor Phillips-style? It’s not gotten us anywhere good so far. The ending of Arthur’s story neatly parallels John’s. He sacrifices himself nobly just before the end of the story to open up the epilogue to another character — John himself, in this case. And while I like the epilogue (which might as well be called “Tying Up Loose Ends“), it really feels like the game ends when Arthur breathes his last. That said, even that epilogue contains that same feeling of bleak apathy, and reflects John’s inability to outrun his past — and we all know how that’s going to go. The very, very end is a few missions of poor old John getting his ill-fated ranch up at Beecher’s Hope running with the help of his wife, son, Uncle, and Charles. This section could have so easily devolved into a wink-wink-nudge-nudge mummer’s show replete with references to the first game. Instead, as with the anticipation of Dutch’s downfall, it’s done with such heartbreaking sincerity that I found myself wishing the whole story could have ended right there. If I had to find a part of the game that sums up my thoughts, it’d be the mission which contains the beautiful D’Angelo song. 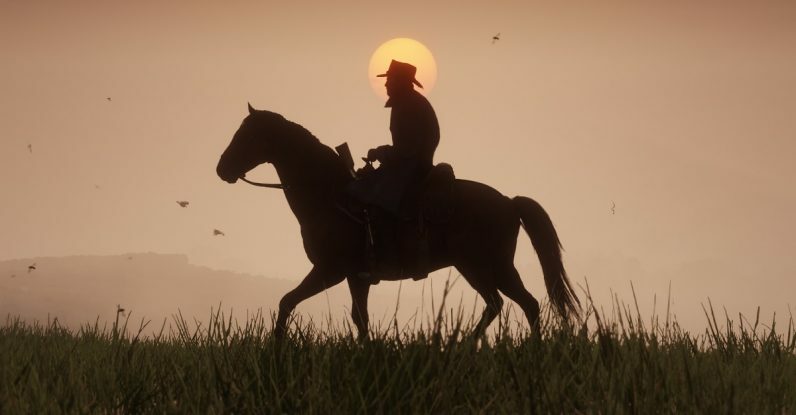 In it, Arthur rides a stolen horse through the dusky night, careworn and half-dead from a failed mission with Dutch, and trying desperately to get to the tattered remnants of his once-close family, now scattered to the winds. It’s stunning. It’s tragic. It somehow manages to top the haunting beauty of the “Far Away” sequence from the first game, all the more so because we already know there’s no happy ending waiting at the end of this ride.